Wanda Beals believes that massage is a form of kindness. Beals is the owner and director of the Milwaukee School of Massage, located at 830 E. Chambers. Kindness is highly underrated. I think we need to be much more kind with one another. Its a challenge in this day and age. Surrounded by classroom tables and chairs, models of skeletons, brains and skulls, neatly folded pink and blue towels, blankets, pillows, plants, candles, vases and flowers, Beals talked quietly in the gray and pink painted classroom about her goals and mission as an educator and businesswoman. I think touch is critical to maintenance of a good healthy life, Beals said. She thinks our culture is one of the more distant ones that does not encourage a lot of touching. Were lucky if we get a handshake. So many of us are not thriving as well as we could because we arent getting touched. Massage, she believes, can help people in the community become more capable of making wise and loving decisions. Beals earned an M.A. in social work from the University of Wisconsin- Madison. After working for seven years as a social worker, Beals became interested in psychotherapy, which then led her to massage. She worked as a massage therapist in a beauty salon in Brookfield for 18 years before founding the Milwaukee School of Massage in 1996. She chose education because she wanted to influence the massage community and thought the best way to do so was through education and teaching so that she would be able to instill certain values she thought were much needed. Beals has run the school from the Riverwest location since 1999 and has been exceedingly happy with Riverwest. Kindness At The Milwaukee School Of Massage With help in the form of low interest loans from the City of Milwaukee, Beals was able to buy the property. It took a bit of work to clean up the yard and outside of the building, and the first floor was extensively renovated before becoming the airy and inviting space that is now the main classroom. Beals runs two massage classes simultaneously  one in the morning and one in the evening. The cost of tuition is $6,900, which includes the cost of a laundry service for the linens, and the student getting a professional massage table and books. Beals also manages a business incubator program on the second floor of the building. At the Graduate Massage Clinic, her graduates are able to get their first paying jobs and get the experience they require to one day open their own business. Beals sought to have a school that would educate students who would ultimately go to work in the community, but she also wanted to be able to provide massages for those people living in the community who were middle and lower-middle and working class. Her location in Riverwest allowed her to achieve both goals. 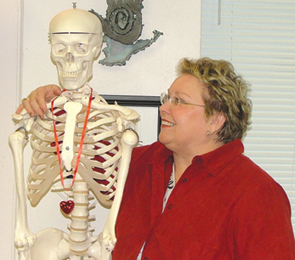 For further information about the Milwaukee School of Massage, call 263- 1179 (school) or 263-1180 (clinic).